Well, here at team Gankstars we’re busy cheering on our top pros Logan and Solo Nazgul in the Fortnite Summer Skirmish Series. There’s a lot on the line with two whole months of exciting competitive play to watch and a whopping $8 million total in prizes up for grabs. Epic Games really have spared no expense, inviting top players and content creators to face off against one another for a slice of some serious cash. Kicking off on the 14th, our boys have already stamped the Gankstars mark on the contest, coming sixth in the opening duos competition and earning themselves just over $13k, followed by Nazgul duking it out in the first solos competition. And that’s just in the first two weeks. Is there much more to come? You bet, stay tuned! Whilst we’re waiting though, let’s ask ourselves a question. In a game that has 125 million players worldwide, how do you go from being no-one to getting a personal invite from Epic themselves to play against the best names on the globe? Making an effort to shift his personality nearly 180 degrees almost overnight, Logan says his game has improved incredibly and he strives to be as chill as completely possible, wanting Fortnite and esports to be an enjoyable place where he can go to relax - a place of happy memories and good times. Solo Nazgul, on the other hand, is not as much of a wraith as his name would imply despite being shrouded in online mystery. Finding his gaming roots in MMOs like World of Warcraft and Maplestory, he switched to the MOBA genre after falling for Defense of the Ancients and now has a long list of competitively played titles to his name. These include Heroes of the Storm, Paragon, League of Legends, Halo 5 and several others. Phew! Where did he even find time for all those? And speaking of the whole team, have you seen our special birthday message to Fortnite yet? Anyway, if you haven’t already followed Solo Nazgul and Logan on Twitter yet, what are you waiting for? 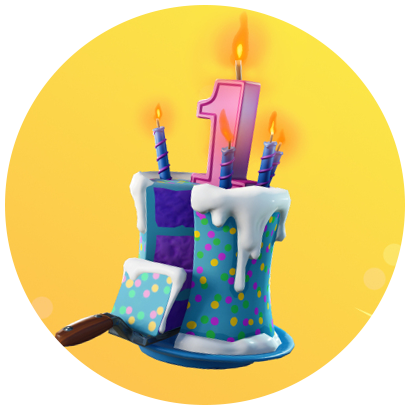 Want to wish Fortnite a happy level up day? Why not tweet them to say hi? And don’t forget to tell them that Gankstars sent you! If you want to check out some VODs or watch the Summer Skirmish live, everything is being broadcast on the official Fortnite Twitch.tv stream. Click here to check your timezone and set your alarm so you don’t miss out on your favourite upcoming matches. See you on the Battle Bus!